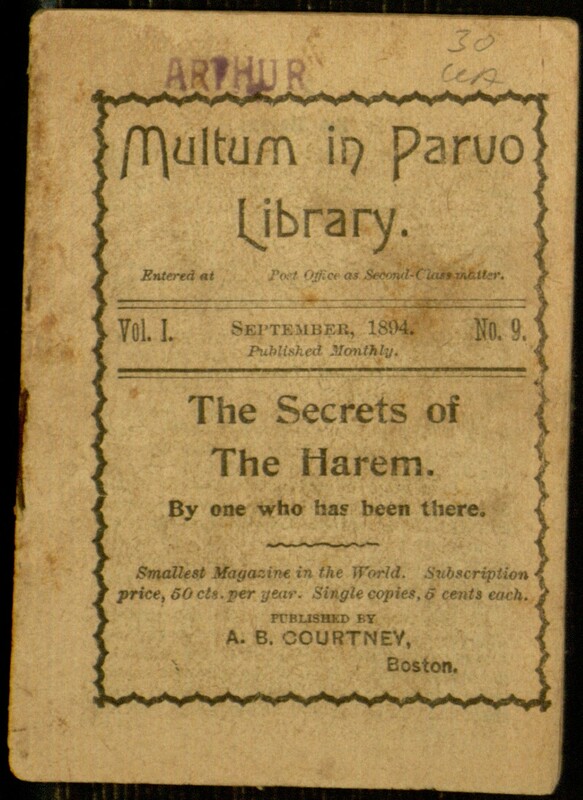 Our latest contribution to Project Gutenberg (with the assistance of the Distributed Proofreaders) is The Secrets of the Harem, one of the tiny chapbooks that made up the Multum in Parvo Library, the self-proclaimed ” smallest magazine in the world” from the late 19th century. The text of the book appears to be drawn from multiple sources, and none of it offers the sensationalism that one might expect based on the title. 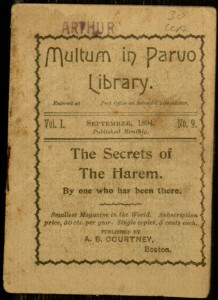 The longest piece is a description of Turkish harem life, presumably written by a Western woman. This is followed by three shorter and more technical pieces describing harem structure and terminology. The booklet is then filled out with advertising and some short essays and poetry completely unrelated to harem life. The complete text (only about 3,500 words) can be read online or downloaded through Project Gutenberg.